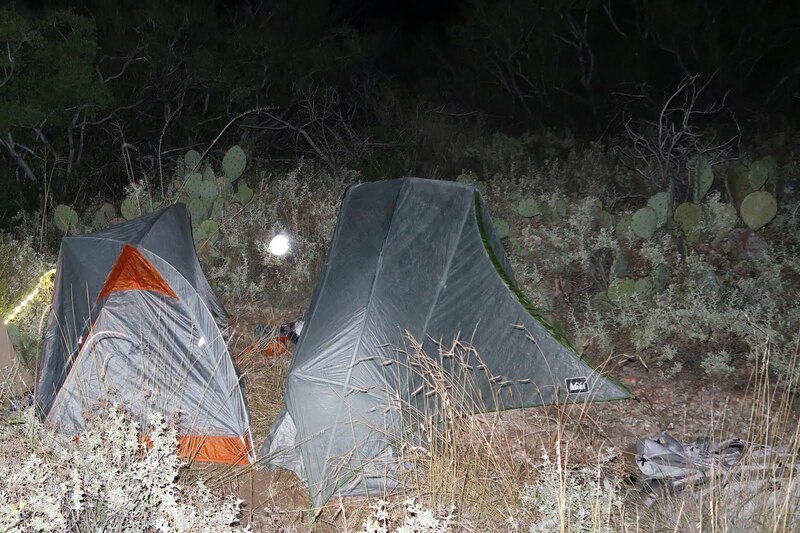 This is day 4 of our recent trip to Big Bend National Park make sure you catch up and read the reports from the previous days: Big Bend Days 1&2 , Big Bend Day 3, and Big Bend Days 5&6. To be the desert, we sure experienced a decent amount of rain and moisture every morning. This resulted in a lengthy process of shaking our tents and rain flies out in order to prevent wetness in our packs (keep our sleeping bags dry). Then we started boiling water for breakfast and finished packing up our gear. Jack posing at the beginning of our Dodson Trail day. I made him carry the water for a little while. We were approximately .5 miles in on the Dodson Trail with another 11 miles to walk and 2,000 feet of elevation change before making it to Blue Creek Trail. With our oatmeal and coffee finished, we were back on the trail around 6 am. Back to walking, the Dodson quickly enters drainage areas where we hiked on gravely dry creeks. In this section, the trail isn’t so much a trail as it just follows dry creeks with short sections of trail, marked by cairns, connecting adjacent drainage areas. It wasn’t long before we missed a cairn for a turn, which caused us to walk a decent amount up a dry creek bed. The clerk at the visitor center had warned us how easy it was to miss a cairn and the difficulty in backtracking because the landscape looks significantly different heading in the other directions. Needless to say, we had a small freak out moment when we realized our mistake. Thankfully, we had no issues finding our missed turn and we must have learned our lesson because we had no issues finding the guiding cairns the rest of the day. The Dodson is fully exposed to the sun of the Chihuahuan Desert and one of the only times I was actually hot. Even Jack was hot and he normally gets chilled pretty easily. Because of the heat, there was little wildlife about except for insects. We walked through multiple swarms of butterflies, pelted by giant Lubber grasshoppers, and chased by more than a few wasps. A mile before Fresno Creek, we dropped down into a drainage area and I spotted something very red in hidden in the brush. It almost seemed like someone was attempting to hide, but soon realized it was a sleeping bag in a red stuff stuck in the brush. I am still a little curious about how that sleeping bag made it to the middle of nowhere. As we made into the next drainage area, we met 2 guys and talked to them for a little while. They used to be a group of 4, but 2 turned around and walked back to Homer Wilson because of heat cramps. I hope they had a vehicle parked there because it seems like they were over halfway through the Dodson. We made it Fresno creek and it was shocking to see so much water flowing through the arid environment. The creek was about a foot across and a few inches deep. We ended up taking a short break and filling up on water again as a safety precaution. No one wants to run out of water to drink in such a hot climate. Past the Fresno, the next valley forced us to do a monster climb up to continue westward toward Homer Wilson. After the climb, we found the only bit of shade under a large rock where we stopped for lunch. The rest of the day was spent walking up huge inclines and then back down all in direct sunlight. Finally, we made it into the dry creek bed that snaked us into Homer Wilson Ranch. Once there, we decide to take a break in the shade at the old ranch house. There were quite a few people in the area. We talked to a father and son about bat poop in one of the buildings and another guy about hiking the Outer Mountain Loop on our way out of the area. Being exhausted, we kicked around the idea of finding a campsite and stopping for the day. We found a spot about .5 mile into Blue Creek Trail we found a nice spot. This nice spot was also occupied by a tarantula, which we shooed away. With our bags hidden away we, walked back to Homer Wilson to pick up our cached water and back where we divvied it up. Looking back, this might not have been the best plan, but it made complete sense at the time. Deciding it was still way too early in the day to make camp, we started hiking again. The trail was at a slight incline and was like walking in a dry gravelly riverbed. AN hour later we stopped and ate dinner. 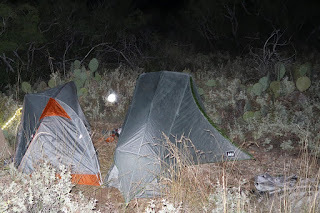 It wasn’t too much further when we realized our dilemma: it is unsafe to camp in a desert floodplain, but being at the bottom of a canyon, there weren’t many ideal locations. We ended up walking past dark trying to find a suitable camping site that provided a little raised ground for safety. We eventually found a small circular area with no rocks and set up our tents so close they were touching.